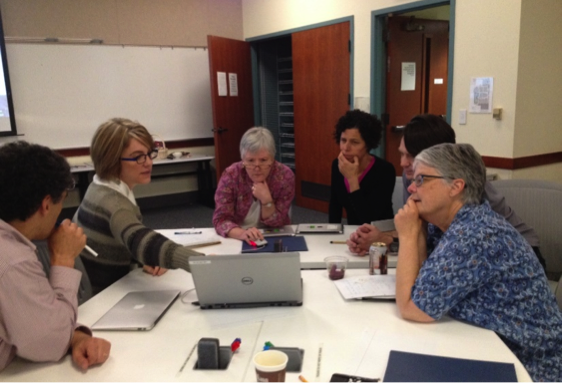 Faculty collaborate in the VCU ALT Lab’s Incubator Classroom. The Academic Learning Transformation Lab (ALT Lab) at Virginia Commonwealth University (VCU) is a cooperative that models and inspires connected learning for a networked world through faculty development, student engagement, communities of practice, and technology enhanced active learning. A folk-healing ritual is presented as part of the face-to-face iteration of the course. 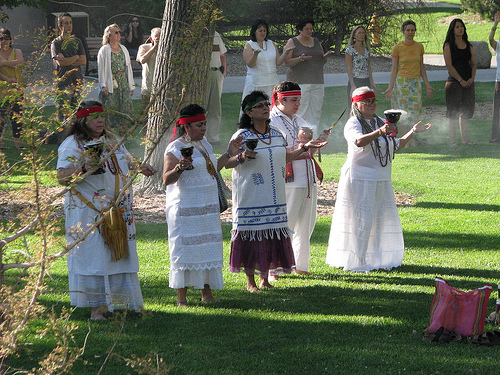 The University of New Mexico’s popular course on Southwestern folk healing, already offered as a summer intensive course for both degree-seeking and continuing education populations, is successfully “translated” for digital delivery to both local and global audiences. 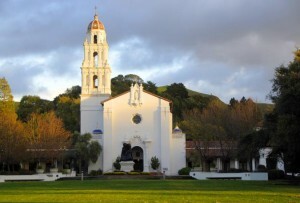 St. Mary’s is also developing hybrid degree programs to increase enrollment on a campus with limited physical space; the Digital Driver’s License is designed to facilitate faculty success in this modality. The School of Economics and Business Administration at St. Mary’s College of California deployed a comprehensive instructional training program for their faculty in 2014 tied to the utilization of a newly created digital media center. 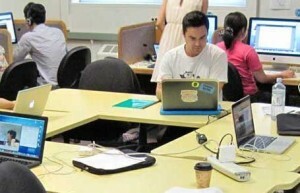 Working in 6-person cohorts, all business school faculty will become certified as “digitally proficient teachers” within two years. 2008 Brian P. Copenhaver Award Reception for Innovation in Teaching with Technology, UCLA, Los Angeles, CA. 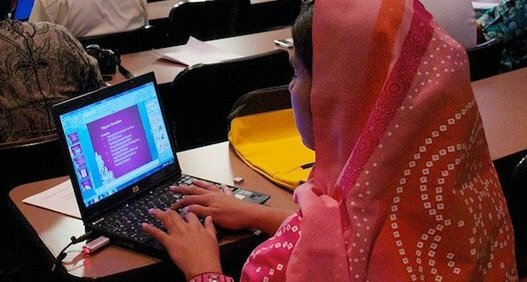 A wide variety of education institutions, including a number of those studied in Our Peers, are developing funding initiatives for faculty development, particularly when it comes to teaching with technology. 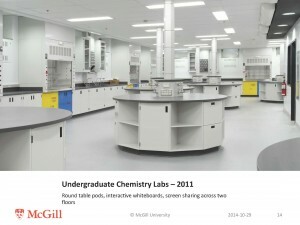 Often funded via private donation, some of the most promising examples include grants and awards for innovative undergraduate education, faculty fellowships within instructional technology units, and internal “venture” funding. Many of these examples have the benefit of public endorsement from the school’s governing board, president, provost, or other campus leaders. 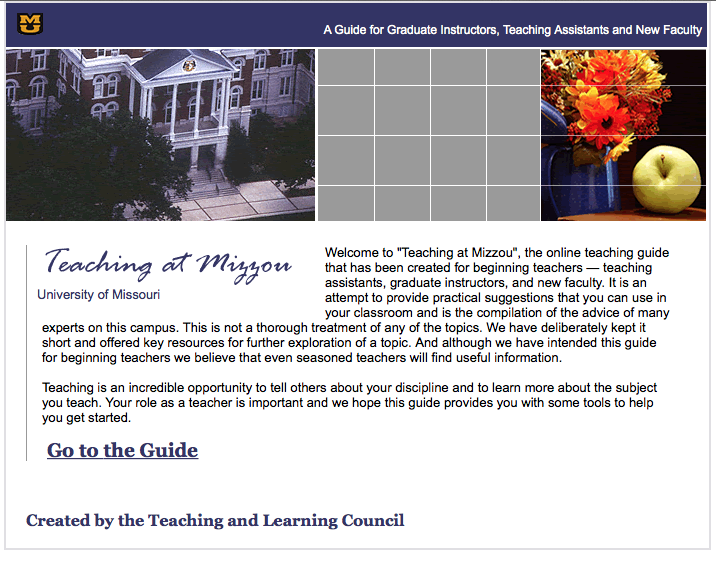 Consortial models allow for consistent messaging, such as this collaboratively-produced guide to teaching at the University of Missouri. One of the most important issues facing technology service providers in a decentralized environment is the challenge of providing consistently impactful services over time. One negative customer service experience can have a longstanding deleterious effect on faculty buy-in. 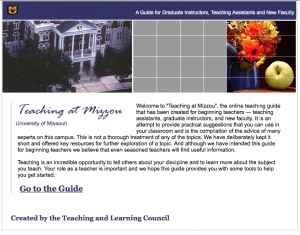 Three ways to improve the faculty experience over time might include: a consortial support model, split-FTE educational technology staff, and/or faculty-driven learning communities. Campus involvement is key to NextGen Michigan’s success. NextGen Michigan is a strategic program to create continuous update of IT systems, programs, and application for the entire university, deploying robust project management practices for major IT related projects. The LMS transition pilot (evaluating Canvas) is a great example of the project management process at work. Penn State’s mascot demonstrates the ease of the One Button Studio. Pennsylvania State University tested out the One Button Studio system as a means of supporting the video production needs of faculty, students, and staff across all of their video production needs: for instruction, mentoring, studying, and all other academic activities. They began with two units and added ten more after a very successful, very popular pilot initiative. 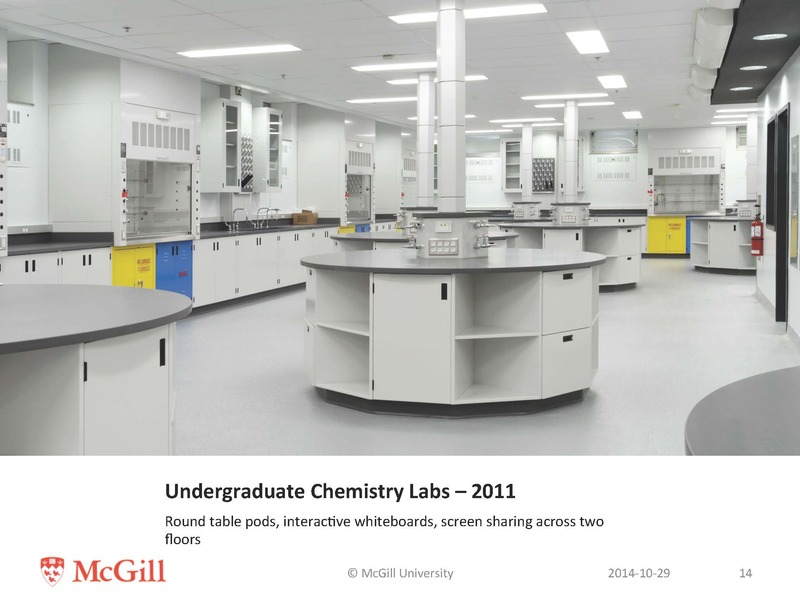 Recently renovated chemistry labs at McGill allow for collaborative, tech-enhanced learning. As many of our peer institutions build new buildings or renovate existing ones, more attention is being paid to questions of universal classroom design—that is, inclusive learning spaces that can be used for multiple teaching and learning modalities. 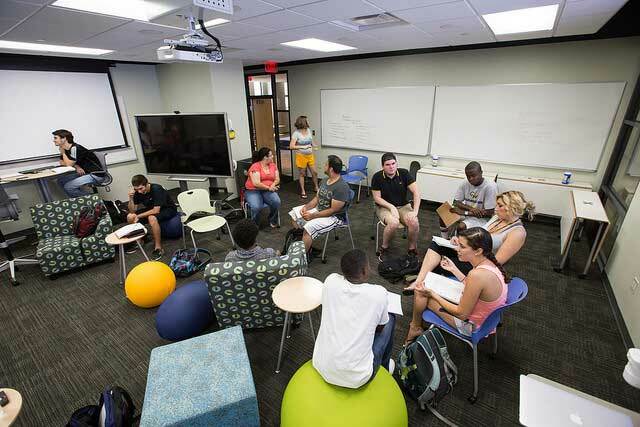 Innovations include flexible seating arrangements, the strategic placement of additional projectors, screens and whiteboards, improved sound design for large active classrooms, and improved processes for renovation and design that better involve all campus stakeholders. 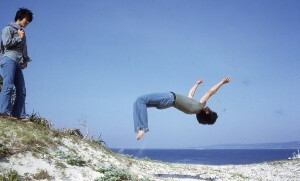 The result is an improved experience for learners of all abilities. Read on for three inspiring examples! Unizin partner universities include a number of official UO comparator institutions. 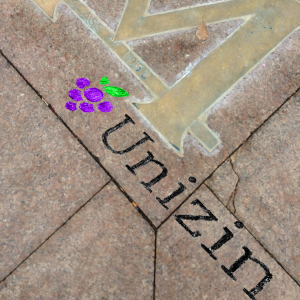 The Unizin Consortium is a member-owned (10 founding investor institutions, all large public R1 universities), invitation-only consortium designed to further cross-institutional partnerships and provide control over the digital education ecosystem, lower costs, establish alignment with standards and generate valuable, real-time data, while eliminating technical barriers.